Chateau / Country House430 sq. ft. The accommodation and 'with 4 beds with a double and a single room and a sofa bed in the lounge. Recently renovated cozy and quaint. Featuring a terrace overlooking the old town, the garden and private swimming pool for guests who will find a barbecue area surrounded by olive groves, sun pink stone with beds and chairs and a veranda with wooden floor, ideal for lunch or dine to 'open air. Possibility of an additional room. We also offer the possibility 'of the formula with breakfast served in the garden amid the flowers, vegetables, relaxation that offers the pool surrounded by olive trees. free wi-fi and bikes for our customers. We also offer the formula with breakfast served in the garden among flowers, vegetables and herbs in the relaxation that offers the pool in the open. Using fresh local and organic products for everyone's needs. We had spent 5 nights in mentioned apartment. The apartment was simple, nice and clean. The swimming pool was fantastic, clean, fresh water. Only one disadvantage and that was a traffic noise from the street because the house was situated at the corner and most of the drivers used the horn to check the free way. The noise of the church bell was loud but understandably used traditional way. The owners were very friendly and helpful. Will recommend the place for stay. We really didn’t know what to expect. Borganzo - a tiny, tiny village up in the mountains, quite a distance from the ocean. But hey, even if we would’ve had big expectaions they would’ve been met. A really good apartement for our family (nothing special, just comfortable) where we could cook some meals (thank you ’Mama Nicola’ for the ruccola and the salvia!) and with a pool where the kids (and the grown ups) could spend hours. Nicola, our host, was just as serviceminded as you want a host to be, helping out with questions about beaches, supermarkets and whatever. We will absolutely come to this place again. Facilissima e veloce la comunicazione con il proprietario, inoltre molto disponibile. Noi siamo stati in 2 adulti più un bambino ed il nostro appartamento era spazioso, soprattutto la sala da pranzo e la camera da letto, bagno e cucinino non sono enormi, ma ci si gira tranquillamente. 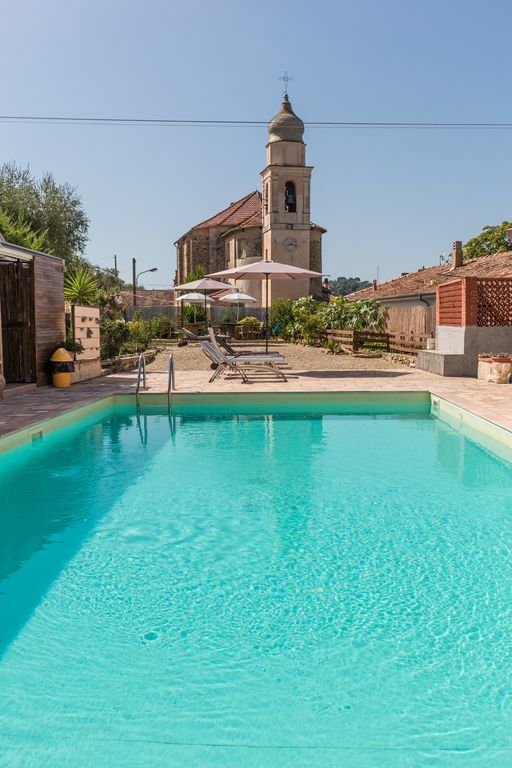 La piscina e il giardino sono ottimi per passare un pò di tempo in tranquillità. Il mare dista veramente soli 10/15 minuti di macchina. Consigliatissimo, se dovessi ripassare in zona ci tornerei sicuramente. We were met in Diano Borganzo by our warm and friendly host Nicola who showed us around our very cute apartment where we stayed for 10 days. The apartment was perfect, with everything a family would need-a nice modern kitchen, a family living room, bathroom and a large bedroom with space for a babies bed. The best bit about the apartment was that it was only a few steps away from the beautiful swimming pool and relaxation area. We went swimming every day and also visited the beach which was only a short drive away. Nicola and his mother kept the communal areas clean and tidy and we had access to clean towels and the use of the washing machine. Also beside the pool there was a lovely seating area where we were able to have our meals outdoors and one evening a BBQ. Each apartment had some private outdoor space but the seating area was spacious and here we were able to enjoy the view of the valley. Diano Borganzo is just a few kilometres from Diano Marina and Nicola gave us plenty of recommendations about places to visit , places to eat and which beaches were the best for us. We had a great holiday here and so did our little boy who just loved the facilities of the pool and the closeness of the beach. A great place for families and for couples looking for a quiet oasis close to Diano Marina. We will definitely be back! Famiglia con 1 ragazzo ed 1 bambina. Siamo stati in questo appartamento per un week-end lungo. Il posto ci è piaciuto molto, l'accoglienza dei proprietari è stata calorosa ed attenta. Si trova in collina ma dista soli 10 minuti di auto da diano marina. L'appartamento lo abbiamo trovato in ottime condizioni, dotato di tutti i comfort. La piscina è un gradevolissimo plus. We are located in a quiet village in western Liguria a few minutes drive from the beaches of Diano Marina, near excellent restaurants, the area and 'ideal for hiking and cycling to the discovery of our inland.